In the beginning, the daily production capacity of PT Angels Products was 500 tons of refined sugar (175,000 tons per year). Through continuous improvement and development, our production capacity increased threefold from what we had initially to a daily production of 1500 tons (500,000 ton per year). The major equipments used in the refinery includes: vacuum pan, centrifugal, resin column, filtration unit, rotary dryer and evaporator, pumps and others. We have also renovated our factory to ensure that all the needs are met for the development of capacity and improvement of the factory. PT Angels Products has utilizes a cool boiler facility which is produced locally. We have selected a Circulation Fluidized Bed (CFB) type boiler to guarantee the highest level of an Electro precipitator (EP), ensuring that machines are controlled to be environmentally friendly. To fulfill our customers’ needs, PT Angels Products has obtained International Certification since 24th November, 2006 for Quality Management. ISO Certificate ISO 9001:2000 NO.202695 was issued by Bureau VERITAS (Certifying Institution) after an intensive audit. Currently all productions processes and supporting activities are applied in accordance with ISO 9001:2000. 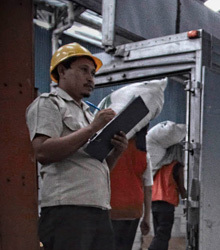 As of 28th May, 2008, PT Angels Products' refined sugar fulfilled all the quality regulations of the Indonesian National Standard of Refined Sugar No. 01-3149.2-2006. PT Angels Products refined sugar is also Halal, as certified by Indonesian Institute of food, drugs and cosmetics and the Indonesian Ulama Council (Indonesia's Top muslim clerical body). We have incorporated ISO 22000:2005, ISO 14001:2004 and OHSAS 18001:2007 within our food and safety management policies and thus we called it Angels Integrated Management System (AIMS). PT Angels Products refined sugar is practical and is used generally by the food, beverage, and pharmaceutical industries. We are continually challenged to improve and fulfill the requirements of our customers. In response to the food industry’s needs, PT Angels Products is now capable of producing refined sugar with two types of grains and crystals. The first type is fine (Mean Aperture=0.40.6mm) while the second type is coarse (Mean Aperture=1.0-1.2mm). The degree of sugar purity of these two types of refined sugar products is the same, which is a minimum of 99.9%.